Jesus looks into the door of the dark cave and cried with a loud voice, "Lazarus, come forth!" AZARUS WAS A Jew who lived with his two sisters, Martha and Mary. Their home was in the little village of Bethany, near Jerusalem, and Jesus often visited them while attending the feasts of the Jews. Always they made him feel welcome, for they loved him dearly, and they believed that he was the Christ of whom the prophets had written long ago. One day while Jesus was in the country east of the Jordan teaching the people, a messenger came hurrying from Bethany to tell him that Lazarus was very sick. The anxious sisters had sent this message, and they believed that surely Jesus would come at once to help them. They knew of his great miracles of healing, and they longed to have him near in this hour of need. But Jesus did not go at once, for he said to his disciples, "This sickness of our friend Lazarus is for the glory of God." And so the messenger returned without Jesus. And the disappointed sisters lingered near the bedside of their dear brother and saw him grow weaker and weaker until finally his breath left his body and he died. How grief-stricken they felt! Why had Jesus not come to them? they wondered. Still they hoped that he might come, for he had even raised the dead to life; but the day wore on and no signs of his coming appeared. Then at last the neighbors and friends who gathered in to help them wrapped Lazarus' body with linen cloths and carried it to the cave where he should be buried. Martha and Mary followed, weeping bitterly, and they saw Lazarus laid in the dark cave and they saw the great stone rolled over the cave's opening. Still their friend Jesus had not come. Four days passed by, and the sorrow of the sisters grew deeper; for now they believed that even if Jesus should come he would be too late to help them. Many friends from Jerusalem were staying in their home trying to comfort them, but only one Friend could comfort and that Friend was not there. At last, after four days had passed, news came that Jesus and his disciples were nearing the village. Martha rose quickly and ran to meet him. Falling at his feet, she cried, "If only you have been here my brother had not died!" Jesus knew how deep was the grief in Martha's heart, and he said, "Your brother shall rise again." "I know he shall rise in the last day, when the dead shall come forth in the great resurrection," answered Martha. "I am the resurrection, and the life," said Jesus, "he that believes in me, though he were dead yet he shall live. And those who live and believe in me shall never die. Do you believe this?" he asked. Martha answered, "Yes, Lord, I believe you are the Christ, the Son of God, who should come into the world." Still Martha did not understand what Jesus meant when he said he was the resurrection and the life. But she left him and hurried to call her sister, Mary; for Jesus had asked why Mary had not come, too. When Mary heard that Jesus had called for her she left the house and hurried out to meet him, for he had not yet come into the village. She found him resting by the roadside where Martha had met him, and she, too, fell at his feet and cried, "Lord, if you have had been here my brother had not died!" The Jews who had come from Jerusalem to comfort the sisters saw Mary rise up hastily and leave the house, and they supposed she was going to weep at Lazarus' grave. So they followed. And they saw her when she met Jesus, and they heard her weep when she fell at his feet. Tears flowed down their cheeks, too, and they cried aloud. Jesus was touched with the sorrow of these sisters and their friends. He groaned when he heard them weeping, and he asked "Where have you laid the body of Lazarus?" So they brought him to the grave. And as Jesus stood near the cave with the sisters and their sorrowing friends, he wept in sympathy with them. 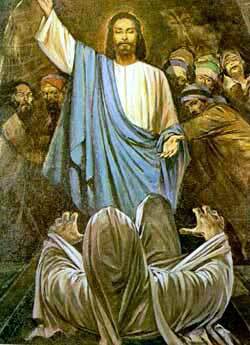 The Jews who had crowded near to watch, whispered among themselves, "See how he loved Lazarus! Could not this man, who opened the eyes of one who had been born blind, have caused that Lazarus should not have died?" While they were talking together, Jesus commanded that some one should roll away the stone from the opening of the cave. Martha exclaimed, "Lord, he has been dead four days, and by this time his body is decaying!" But Jesus answered, "Did I not tell you that if you would believe you should see the glory of God?" So they took away the stone, and while the people stood by Jesus lifted his eyes to heaven and said, "Father, I thank thee that thou hast heard me. And I know that thou hearest me always; but because of the people who stand by I said it, that they may believe thou hast sent me." Then he looked into the door of the dark cave and cried with a loud voice, "Lazarus, come forth!" The astonished people saw the still, white form within the cave rise up and walk out to speak with them. And Jesus told the friends to untie the linen cloths and remove the napkin, which covered his face. And Lazarus was alive once more. After this miracle many of the Jews who had come form Jerusalem to comfort Martha and Mary believed that Jesus was the Christ. And soon the scribes and Pharisees and chief priests at Jerusalem heard what had happened at Bethany, and they were greatly excited. "What shall we do?" they asked, "for it we let him go soon all men will believe in him, and the Romans will come and take away our nation." And from that time the enemies of Jesus began to plan how they might capture him and kill him.